The largest Constitution Celebration in America may possibly be Gilbert Constitution Week in Gilbert, Arizona. This according to former US Secretary of Education, Dr. Rod Paige, guest speaker at the 2004 Constitution Week Fair. As many as 10,000 people gather for Constitution related entertainment and education. Past guests also include Lee Greenwood and Sandra Day O'Connor. While our nation enjoys a deep history of amazing, rich, and moving patriotic music, there is very little music written specifically and directly about the Constitution, the purpose of its founding, and the relationship we have with it now over two centuries later. The organizers of Gilbert Constitution Week, Barb Stowell, Bill Norton, and many others, have been working tirelessly for six years to provide a foundation of education about the Constitution in the southeast valley. What better way to educate and inspire generations old and young to rally behind this fortress of defense that is our Constitution than through the power of music. Thanks to the vision of Barb and Bill, and with their collaboration, I have written an anthem to the origin and purpose of this monumental document as a production of Gilbert Constitution Week. 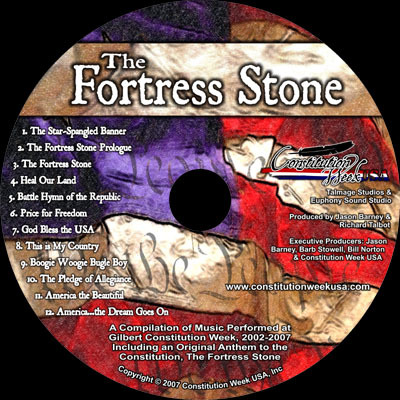 The Fortress Stone premiered at the September 2007 Gilbert Constitution Week with a live vocal performance and CD recording featuring Jordan Bluth as soloist with full symphony orchestra and choir. For information on purchasing a CD, contact jason@talmage.com. Donations toward production costs are gladly accepted. Purchase a copy online at ConstitutionWeekUsa.com. The Fortress Stone was also be performed live on Nov 11, 2007 by the Tempe Symphonic Wind Ensemble at the new Tempe Center for the Arts as part of a Veteran's Day celebration. Jordan was the soloist for this event.